The older I get, the more convinced I become that the secret to happiness is finding pleasure in small moments. Sometimes these small moments come in interaction with others – a moment of shared humor, or the feeling of intellectually flying that I get from a particularly lively class or book discussion. But more often for me, these small moments are solitary moments of sensual pleasure. 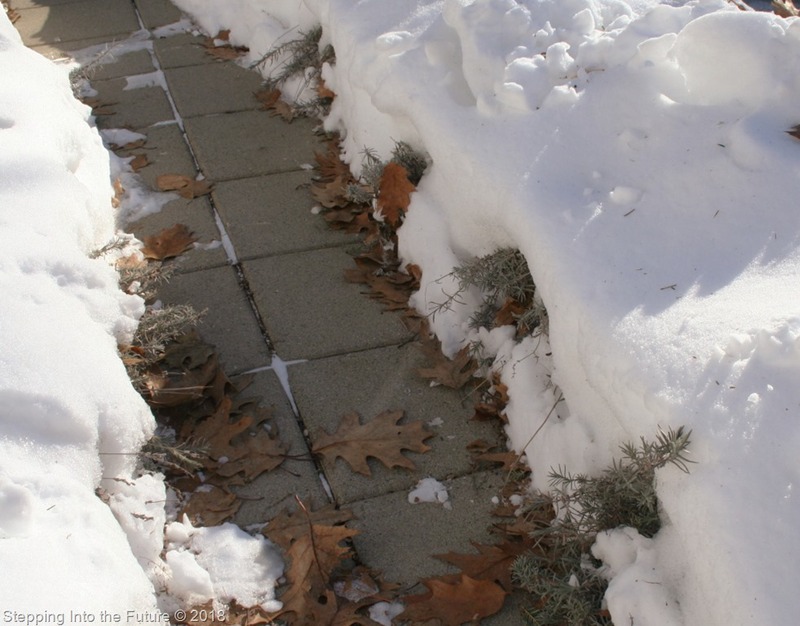 One such moment came recently when I was out shoveling snow along a narrow walkway at the front of my house. This is a part of my garden that I call the “Lavender Walk” because English lavender is planted on both sides of the walkway. The garden is mostly buried under snow at this time of year, but as my shovel brushed the edge of the lavender plants, their essential oils were released and the scent of lavender wafted on the air. In a fragrance-deprived season, that summery perfume was a swoon-worthy delight. Such sensory pleasures are my primary motivation for gardening. I often use routines and rituals to focus my attention on small pleasures. During the garden season, for example, I begin each day by pouring out my first mug of tea and taking it with me as I step outside to walk slowly through the garden. I always follow the same route, focusing in turn on each garden area. Depending on the month and the weather, my “morning tour of the garden” can take anywhere from fifteen minutes to more than an hour, but it always brings small moments of pleasure as I note small changes, new growth and new buds. Ordinary sensual pleasures become something special when they are not always available. The pleasures of the garden are seasonal, and the anticipation of each season’s delights adds another layer of pleasure. As the days get longer and the sun gets stronger in March, for example, I wait for the heady moment when the first crocus will push up through the melting snow and bloom. By the time the crocuses fade, other flowers have taken their place, taking center stage for a few days or a few weeks. In mid-summer, daylilies (one of my favorite plants) are the glory of my garden, and their bloom is preceded by weeks of watching their developing buds and anticipating their glorious flowers. Food is another area of my life where I regularly savor small moments of pleasure. Because I try to buy as much of my food as possible from local farmers, my food pleasures, like my garden pleasures, are heightened by their seasonality. As each crop is harvested and becomes available at the farmers’ market, I rediscover favorite meals that I haven’t eaten in months. In fall, for example, as the pumpkins, winter squashes and root vegetables reappear, I delight anew in the pleasures of rich winter soups and in such main dishes as butternut squash galette and sweet potato quesadillas. This week, I’ve been savoring the foods of my annual Christmas turkey feast. Yesterday, I enjoyed the olfactory pleasure of turkey stock simmering on the stove all day long, and I now have many quarts of soup stock and packets of turkey meat in the freezer for delectable winter meals. As December gives way to January, I have turned my attention to the quiet pleasures of winter: the rosy glow of a winter dawn, the sight of trees cloaked in new snow, turning out lights in the house to watch a big winter full moon rising through the woods, the amazing quality of moonlight on snow, the breathtaking view of a star-filled sky on a clear winter night. And I’m watching the new growth on my potted amaryllis bulbs, anticipating the pleasure of their beautiful flowers in the weeks to come. In every season, each day brings small, exquisite moments of pleasure, providing me with daily feelings of contentment and happiness. Oh, I am so on the same page with you concerning the “small pleasures.” We notice them more at this time of our lives, I think. And some things that we may have NEVER noticed become a delightful surprise. Indeed, there are surprises around every bend, it seems, as our internal “detectors ” become more sensitive. Those inner “Geiger counters” are clicking away furiously as they begin to make note of new (or possibly old) sensory delights. I do love the intellectual, emotional, physical and even spiritual re-awakenings that can occur, often on a daily basis. What is it they say? “Slow down and smell the coffee?” … or lavender, or the earth, or fresh herbs at the farmer’s market… etc., etc., etc. Sue, It seems to me that one of the gifts of retirement is the gift of time to slow down and pay attention to those small moments. I tried to do this when I was working 60-80 hours a week, but it was a struggle to make/take the time. I don’t know how you managed 60 – 80 hours a week! Even though I am still working (NOT 60 – 80 hours… whew!.. ), I am carving out more time to pay attention to the small moments. A long time ago I remember seeing a brilliant young gentleman, with a very intellectual job, just sit and watch a bug crawling around. He did this for what seemed endless and I remember thinking, “Wow! I need to do that!” Nowadays it’s not so much bugs but the charm of other wonderful sights, sounds and smells that capture my attention and hold me in their spell. Lavender scented snow, a bit like whistle while you work. I love the idea of smelling lavender in newly shoveled snow, makes me smile. This post reminds me of May Sarton’s writing. The wonder and awareness of small moments of pleasure that you write about is something I’m still learning to appreciate. I do appreciate them but it just doesn’t always seem to be enough to stop me from wanting something elusive and undefined. Jean, I started reading May Sarton when I was in my early thirties, shortly after my marriage broke up and when I began living alone. Especially through her journals, she served as a mentor for how to create a solitary life full of sensual pleasure. She remains an inspiration. I love this post! So true; small pleasures that occur throughout the day make my heart smile. Thank you for sharing, and a great advise to remember going into a new year. Such a beautiful post. I savoured each word picture you painted. I was in Portugal over Christmas and I knew that one of the delights would be the Portuguese custard tarts. I was not disappointed. Our tour director knew the best place to get them and treated us to warm tarts with the flakiest crusts and the tastiest soft custard, the monks’ secret recipe since the 1800’s. Pasteis de Belem. We tried to have one each day we were there. Even Starbucks in the Lisbon airport in offered them! Another sensory pleasure I enjoyed there was the outdoor seating. In the fresh air, beside the ocean in Nazare, feeling the sun’s warmth on my back, and just being. . . relaxing. . . chatting. . . eating. . . leisure. Sitting in those simple outdoor seats is something that never gets old for me. Especially coming from Canada where the winter cold keeps us indoors more than out. In Portugal in the cities at night, the heaters are lit and the diners enjoy their meals outside. I tried to use all of my senses and to absorb the beauty all around. There was so much to take in, The tidy terraced vineyards, the colourful homes and fishing boats, the haunting sounds of Fado, the taste of fresh fish and artisan breads, the sight of medieval castles and Roman aquaducts, the sound of churchbells and children, the stillness of tiny villages with lovely views. What richness life invites us to share as we open ourselves to the delights all around! The simple pleasures do not pall with age. I still feel a sudden leap of the heart when I come across a wise book or a beautiful song or a kindly welcome. Honey Bee, Thank you for this thoughtful and evocative comment. My mouth is watering just reading your description of those Portuguese custard tarts! I didn’t learn how to savor the sensual pleasures of travel until I began traveling alone in my forties. Before that, I was too busy worrying about whether the other person was having a good time to immerse myself in all those exquisite sensory delights.